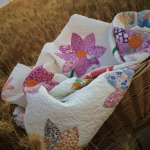 Residing in a generations-old family farmhouse (in the wheat fields of eastern Washington), Milk Bottle owner, Juli Weishaar, finds great pleasure in quilting personalized gifts for friends and family. When she's not working as a full-time business manager at the local school, Juli enjoys stitching with friends, as well as sharing her passion for quilting with all who wish to learn, or be involved with, the time honored skill of quilting. In addition to providing her customers with a great selection of high quality fabrics, quilt kits, and block of the month programs, Juli’s goal is to make Milk Bottle Quilt Co. a friendly online network of fellow stitchers who share common interests.